The player must inform his opponent in match play or his marker or a fellow-competitor in stroke play that he intends to play a provisional ball, and he must play it before he or his partner goes forward to search for the original ball. So, once the player has dropped a ball at the point where they last played from (or played another ball from the teeing ground if it was their tee shot that is lost) that is now the ball in play. It cannot be a provisional ball, even if it is announced as such, and it is irrelevant whether or not the original ball is found, as it may not be played. Q.Under Rule 27-2a, when is a player considered to have gone forward to search for the original ball such that a provisional ball cannot be played? Why not run a quiz night on the Rules of Golf for your Golf Club or Society? I have done all the work for you. Click here for more information. What about a situation where caddies stand down the fairway while players go back to the tee. Player 1 hits, and while waiting for Player 2 to hit his caddie begins searching for his ball. He shrugs back at player as he can't find it (yet). Can Player 1 then say he's hitting a provisional? As the player is responsible for the actions of their caddie, strictly speaking the player may not play a provisional ball after their caddie has 'gone forward to search' for their ball. However, I would not prevent a player from playing a provisional ball, when it was his turn to play it, just because his caddie had started to look for the original ball, as the whole purpose of playing a provisional ball is to save time if the original ball turns out to be lost or out of bounds. My friend hita ball in the woods and then played a provisional.He hit his provisional in the fairway. Then after the provisional a second time laying on green he found his original tee shot. Which ball would be in play the original or the provisional laying on green? If your friend played a stroke at the provisional ball from further from the hole than the place where the original ball was likely to be then the original ball was still in play and had to be played when found in bounds (see Definition of lost ball). 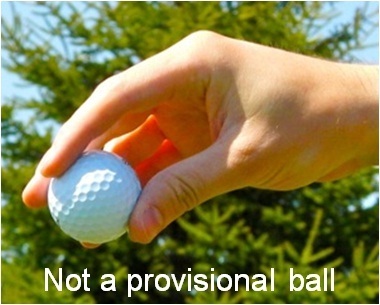 However, if a player has played a provisional ball from a place nearer the hole than where their original ball is likely to be lost, that is then the ball in play and the original ball has to be picked-up or abandoned. Someone played his shot off the 1st hole today in a medal round. After looking for a minute for his ball, he went back to the tee to play a provisional while his playing partners continued to look for his ball. He hit his provisional ball and before he could play his second shot with the provisional ball, the playing partners found his original tee shot [within the 5 minutes]. He played his original ball which was about 75 yards from the tee and carried on playing the round. He was told in the pro shop after he played all of the round that he was disqualified from the Medal Round because his original ball on the first hole was more than 50 yards off the tee. The player should have continued with the ball in play, which was the second ball played from the teeing ground (lying 3), so the disqualification for playing with the wrong ball was correct. We had a very confusing set of circumstances in a medal this weekend involving two of my playing partners. Both hit their drives down the left with player 1 hitting what he believed to be his ball whiile player 2 looked for his ball. After 5 minutes searching, player 2 went back to re-tee. Then playing up the hole. Only when we got to the par 5 green did player 1 notice he was playing player 2's ball. At this point player 2 abandoned his second ball and with player 1 went back to the place his original ball had been played from with player1 finding his ball and playing up the hole from there. As player 1 had played plater 2's ball twice there was belief in the clubhouse he should have a 4 shot penslty (2x2 shots) we believed it was only a 2 shot penaly? Was player 2 right to abandon his 2nd ball? Unfortunately, in the circumstances, as soon as player 2 played a second ball from the teeing ground that was his ball in play. Because he did not finish the hole with that ball he is disqualified from the medal competition. Player 1 incurred two penalty strokes for playing a wrong ball. Rule 15-3b states that strokes made by a competitor with a wrong ball do not count in his score. I played a 2 man match play.We were tied at 18. My opponent hit his tee shot in a tree to the left. I hit my drive. Then we proceeded to look for his ball on the left side for a while, more than 5 minutes. Then I told him he should hit another tee shot. He did, then we proceeded to head down to our balls down the fairway. On the way he asked that I drive down the right side of the fairway to look for his ball one last time. He seen a ball in the rough and said it was his. I didn't asked how he marked it. He played the ball we found. He then one the hole by a stoke, and one the match. This was my first tournament and I was on my 3rd round playing well. I now think I know that I won the match. What should I do now? There is nothing that you can do now except familiarise yourself with Rule 2-5, so that you know how to make a claim in match play. As soon as either of you played from the next teeing ground, or have left the last teeing ground of the match. Your opponent lost the ball as soon as he played his original ball, which was lost under two counts, a) because it was more than 5 minutes after search beginning for it when it was found, and b) the other ball played from the teeing ground was the ball in play. I strongly recommend my eDocument, 'So You Are Going to Play Match Play!' for anyone that is new to play match play, as there are many Rules that differ from stroke play. You can purchase from my www.RhodesRulesSchool.com web site. Taking Relief – Penalty, or Not?